Geoglyphs are large figures which are carved out of the ground, and can only be seen properly from the air or from a distance if on the side of a mountain. Ancient Geoglyphs carved on green grass, exist in many countries. Figures have been created since ancient times in the form of animals, abstract symbols and people. The most famous Geoglyphs in the world are the Nazca lines in Peru were rocks were dug out from the ground. The shallow trench on the rocky surface differs in color from the rock and does not overgrow with greenery, so they survived to our time and are clearly visible from the air. 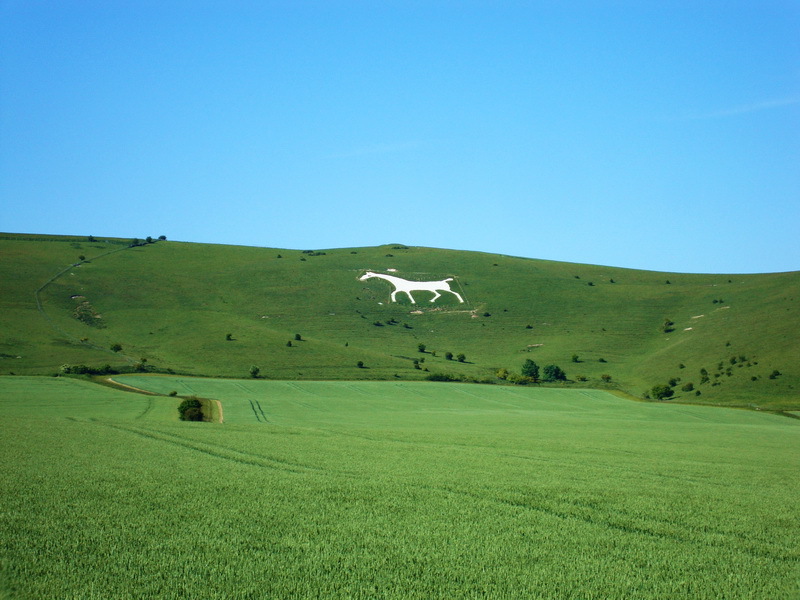 In England there are more than 50 different Geoglyphs, 14 of them are white horses. Eight of them are in the county of Wiltshire. 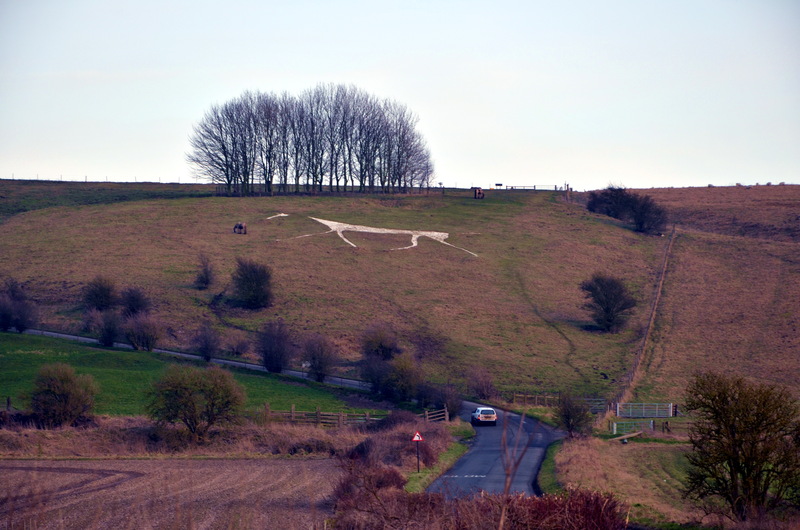 The Uffington Horse in Oxfordshire is the oldest horse Geoglyph in Britain. The History and the creation of this horse like figure is not known but scientists have proved that it has existed since the Bronze Age (10th century BC). There is mention of it in documents of 1742. There were many other Geoglyphs in different places, which have come to light by using a special infrared photography the earth’s surface. Many of these have been restored. Geoglyphs in the shape of horses in the hills of England are made by three different methods. First, the outline on the turf is covered with rocks. Second, a trench is dug out and filled with chalk and gravel of a different color, mostly white limestone, which contrasts with the green grass. These Geoglyphs have to be constantly maintained, as they quickly overgrow with grass. 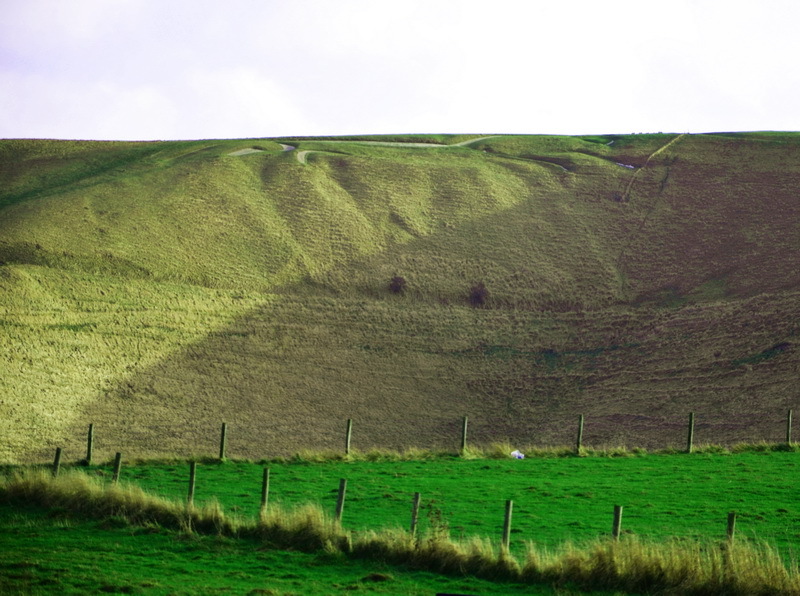 The third way is the stripping of the soft soil in the shape of the Geoglyph to expose the chalk beneath. 1. The Westbury White Horse is one of the oldest in the county of Wiltshire. The figure was cut in 1778 on the site of an older one; the design was taken from an engraving of 1760. It is assumed that the Geoglyphs were made to commemorate the victory of King Alfred’s Battle in 878. Recently the figure was restored in 2007. 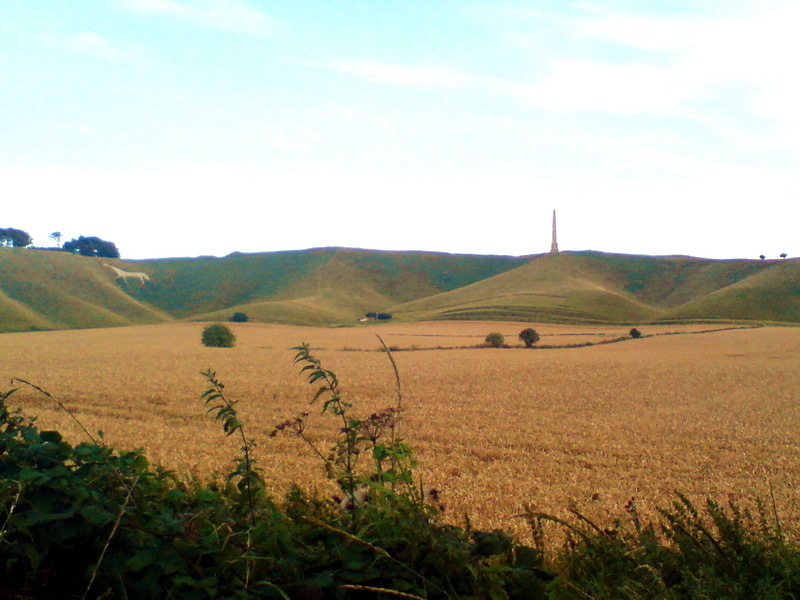 The Westbury Horse can be seen on the Salisbury Plains 2.5 km east of Westbury. 2. The Devizes White Horse has existed since ancient times, but was eventually lost. In 1954, a boy from the local high school found the shape of the horse on the grass; this was confirmed by scientists at the time. In 1999 the figure was restored to celebrate the Millennium, but a new Geoglyph was cut in the shape of the old one, in another place where land was provided by the local farmer. 200 volunteers participated in this project cutting the trench whose length was 230 m and then filled with chalk. 3. 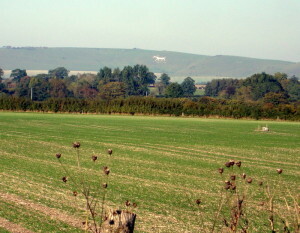 The Marlborough White Horse is located near Marlborough College. The boys of the Marlboro academy cut it in 1804 and it became a tradition every year to clear the ground of weeds and restore the picture. When the school was closed, it became overgrown with grass but was restored in 1860 and later in September 2001. Now this Geoglyph can only be seen from a footpath leading from Preshute House to the A 345 road. In a verse about Marlborough College there is mention of the Horse figure and the events of 200 years ago. 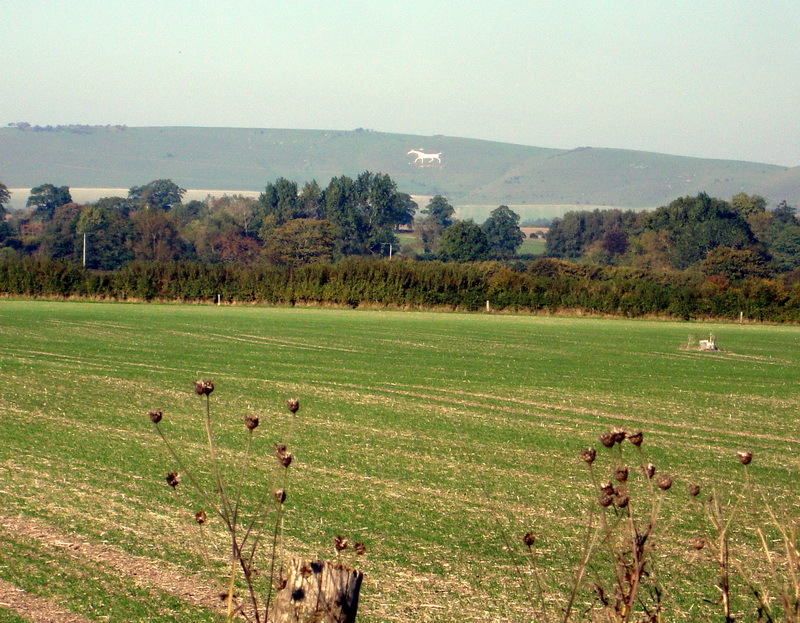 It goes as follows “…and see the old White Horse still pads up there on Granham hill”. was created in 1937 on the site of an existing figure of 1785 in honor of King George VI coronation. The Geoglyph was floodlit within a week after the coronation. 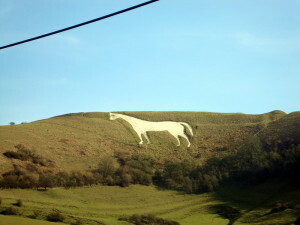 This Horse can be viewed from quite a few places in the surrounding area. 5. The Hackpen White Horse near the village of Broad Hinton is in a very bad condition, overgrown and not very conspicuous from the road. This is the only Geroglyph from the 19th century and very little is known of its history. They say that it was made in honor of the coronation of Queen Victoria. 6. 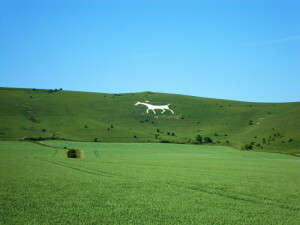 The Cherhill White Horse was cut in the 18th century and is the third oldest Geoglyph of a horse in Britain. This figure is clearly visible from the road and is located on a hill near the obelisk in honor of Sir William Petty, an English economist, scientist and philosopher. Lord Henry Petty one of his ancestors erected the monument in 1845. 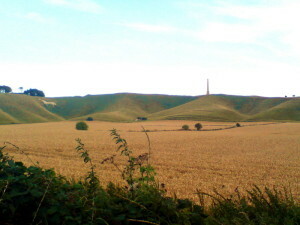 This Horse and the obelisk can be seen from the A4 near the village of Cherchill. 7. 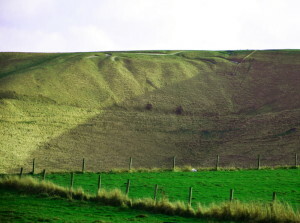 The White Horse near the town of Broad was cut in 1864; the approximate size is 24 m by 36 m. The white chalk outlines can easily be seen from the nearby road. a Cherchill horse. There is a tradition on the winter solstice in December to light up the horse with illuminations. They say it’s extremely impressionable viewed from the road! Similar traditions are connected with other Geoglyphs. The Horse in Devizes was illuminated on New Year’s Eve 2000. The Westbury horse was lit in 1950. According to eyewitnesses at the time, it seemed like the horse was floating in mid air. Many drivers along the road were amazed and delighted at the sight of such a phenomenon. The Cherchill horse was covered with red lights and spotlights in 1937 for a week in honor of the coronation of King George VI and Queen Elizabeth. In the 18th century the horse was a heraldic symbol, in 1872 the figure of a horse was drawn on the flag of the county of Wiltshire and has remained the symbol of the county ever since. This entry was posted in Photo gallery, Unusual monuments and tagged The white horse Geoglyphs. Bookmark the permalink.